11 excursions were organised in 2016 - the majority to proposed Local Biodiversity Sites (pLBS). 62 different individuals attended the outings, collectively contributing 94 volunteer days to TWIC. Thank you to everyone who attended, especially the following who led outings for TWIC in 2016: Gary Hovell, Douglas McKean, David Long, Liz Lavery, Sarah Eno, Michael Scott, David Chamberlain and Pat Batty. Thanks also to the landowners and land managers who gave us permission to access their sites. Several locally rare plants: Alternate-leaved Golden-saxifrage (Chrysosplenium alternifolium), Hybrid Avens (Geum rivale x urbanum = G. x intermedium) and Celery-leaved Buttercup (Ranunculus sceleratus). A number of invasive non-native species were also noted such as Giant Hogweed (Heracleum mantegazzianum) plus garden escapes like Himalayan honeysuckle (Leycesteria formosa). 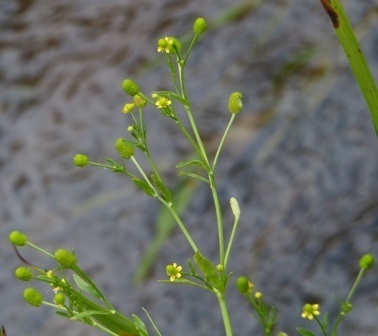 Celery-leaved Buttercup (Ranunculus sceleratus). Photograph courtesy of Mike Beard. 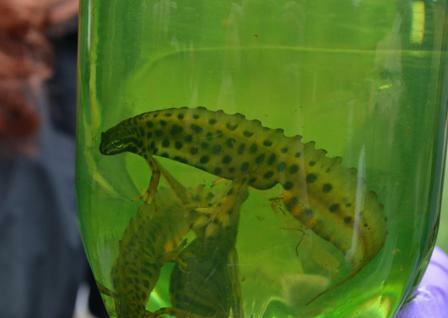 This was a joint meeting with the Lothian Amphibian and Reptile Group (LARG). Both Smooth (Lissotriton vulgaris) and Palmate Newt (Lissotriton helveticus) adults and an eft were recorded plus a Common Frog (Rana temporaria). More photographs from the outing can be found on LARG's Facebook page. This was a joint meeting with the Borders bryophyte group. Vascular plants, bryophytes (mosses and liverworts), fungi, birds and a few molluscs and amphibians. 154 vasulcar plants were recorded, the highlights being Moschatel (Adoxa moschatellina; pictured), Soft Shield-fern (Polystichum setiferum) and Common Wintergreen (Pyrola minor). Of the 83 bryophyte (mosses and liverworts) species recorded, the most interesting were Blueish Veilwort (Metzgeria fruticulosa), Petty Pocket-moss (Fissidens pusillus), Hartman's Grimmia (Grimmia hartmanii) and Drummond's Pincushion (Ulota drummondii). A good number of fungi were also noted - 53 in total. 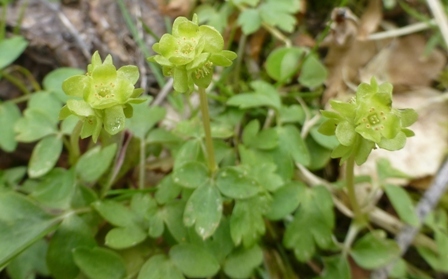 Moschatel (Adoxa moschatellina). Photo courtesy of Andy Swales. 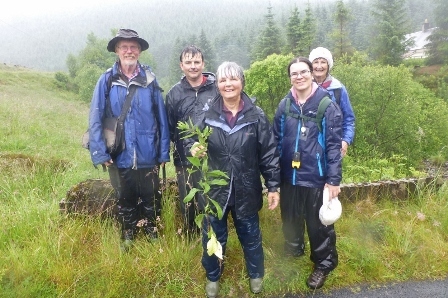 The group botanising on the former site of the curling pond. Photograph courtesy of Roy Sexton. Vascular plants, bryophyes (mosses and liverworts), birds and an amphibian. Botanical highlights included White Sedge (Carex canescens); Hedgerow Crane's-bill (Geranium pyrenaicum) - First record for vc87; Hop (Humulus lupulus) - First record since 2000 for vc87; Northern Marsh-orchid (Dactylorhiza purpurella); Marsh Cinquefoil (Comarum palustre); Marsh Pennywort (Hydrocotyle vulgaris); and Bogbean (Menyanthes trifoliata). Vascular plants, bryophytes (mosses and liverworts), birds, butterflies and a few amphibians and reptiles, bees, moths and mammals. David Long found 3 bryophytes new to Selkirkshire - Ghostwort (Aneura (Cryptothallus) mirabilis) - the UK's only white liverwort - Fingered Cowlwort (Colura calyptrifolia) and Fairy Beads (Microlejeunea ulicina). The most interesting vascular plant finds were Melancholy Thistle (Cirsium heterophyllum), Marsh Valerian (Valeriana dioica), Beech Fern (Phegopteris connectilis) and the Twayblade orchids, Listera cordata and L. ovata. The group were in good spirits despite the weather! Photograph courtesy of Andy Swales. Vascular plants, butterflies, bees, mammals and a few moths, fungi, birds, bryophytes, beetles and molluscs. 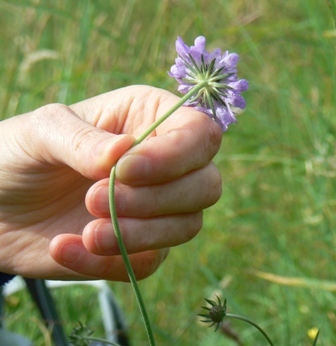 The botanical highlights were Salad Burnet (Poterium sanguisorba), Small Scabious (Scabiosa columbaria; see picture) and Field Madder (Sherardia arvensis). We also found the locally rare moth, Red Carpet (Xanthorhoe decoloraria). Michael Scott re-visited the site after the excursion and managed to re-find a couple of plants of Hoary Plantain (Plantago media). Vascular plants, bryophytes (mosses and liverworts), birds, bumblebees, fungi and a few mammals, flies and beetles. Botanical highlights were Black Spleenwort (Asplenium adiantumnigrum), Black Bent (Agrostis gigantea), Wild Onion (Allium vineale), Bloody Crane's-bill (Geranium sanguineum) and the garden escape Achillea macrophylla. They say "save the best for last" and this was certainly the case on this outing. As we came to the end of the excursion we found an interesting patch of disturbed ground near the railway where we identified Fern Grass (Catapodium rigidum; pictured), Chamomile (Chamaemelum nobile), Annual Pearlwort (Sagina apetala), Hare's-foot Clover (Trifolium arvense) and Squirreltail Fescue (Vulpia bromoides). Fern Grass (Catapodium rigidum). Photograph courtesy of Natalie Harmsworth. 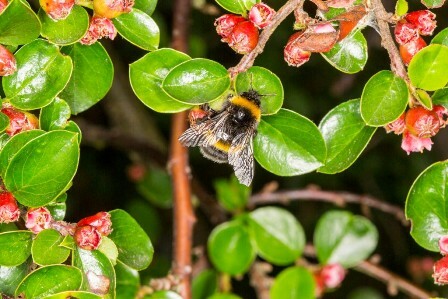 1 of 4 bumblebees recorded on the outing, a Buff-tailed bumblebee (Bombus terrestris). Photograph courtesy of David Palmar (photo taken at Vogrie). This was a joint meeting with the Edinburgh Natural History Society (ENHS). Vascular plants, bryophytes (mosses and liverworts), bees, mammals, birds, butterflies, plus a few flies, true bugs, fish and a beetle. 177 vascular plants recorded and 21 bryophytes. The moss Short Pottia (Hennediella macrophylla), which in Scotland is only known from the Tweed Valley and NE Scotland, was an unexpected find. Vascular plants, bryophytes (mosses and liverworts), plus a few birds, bees and butterflies. 119 vascular plants and 53 bryophyte species recorded, including Atlantic Pawwort (Barbilophozia atlantica) on mildly base-rich outcrops. 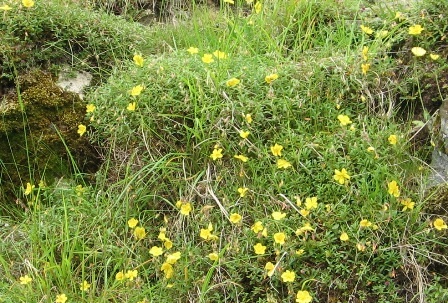 Common rock-rose (Helianthemum nummularium). Photo: Natalie Harmsworth, from another site. 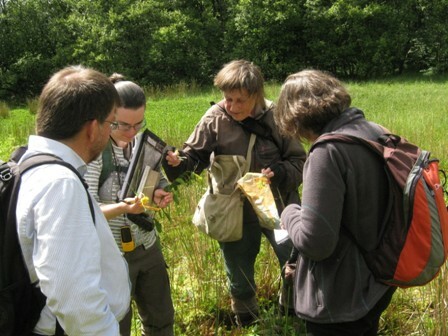 This was a joint meeting with the Inner Forth Landscapes Initiative (IFLI). Vascular plants, Odonata (dragonflies and damselflies), amphibians, bryophytes (mosses and liverworts), plus a few fungi, bees, beetles and other insects. The weather was not kind to us, so we did not see any adult dragonflies on the wing. However, we did identify two species of dragonfly larvae in the pond - a Blue-tailed Damselfly and Large Red Damselfly. Pat Batty also was able to show participants a variety of exuviae of other species. The site provided a few botanical surprises, including Narrow-leaved Hogweed (Heracleum sphondylium subsp. sphondylium var. 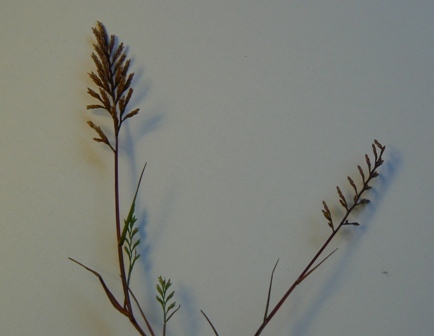 angustifolium) new to vc87 and Fool's Parsley (Aethusa cynapium), which has only 15 other records for VC87. 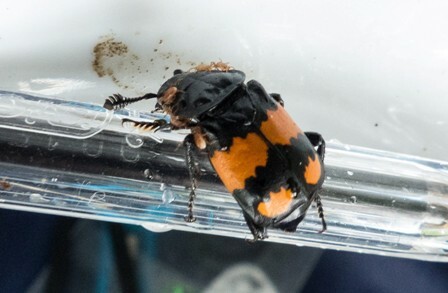 The striking carrion beetle Nicrophorus vespilloides (photographed) was also interesing to see. There is a new recording scheme for Carrion Beetles (Silphidae), see: www.coleoptera.org.uk/home. Vascular plants, bryophytes (mosses and liverworts), fungi, plus a few birds, beetles, lichens, insects and amphibians. Highlights included the bryophytes Lesser Notchwort (Lophozia bicrenata), Hill Notchwort (Lophozia sudetica), Clay Earth-moss (Archidium alternifolium), Drummond's Thread-moss (Pohlia drummondii) and Lesser Fringe-moss (Racomitrium affine). A good variety of fungi were noted including the aptly named Hedgehog Fungus (Hydnum repandum), which has whitish spines on the underside of the cap rather than gills. 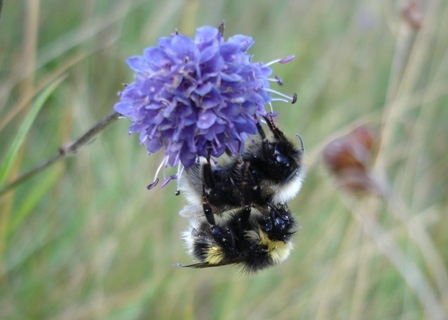 Buff-tailed Bumblebee mating pair (Bombus terrestris). Photo courtesy of David Adamson.